Nutrition nonsense is everywhere. Fads and half-truths prey on our hopes and desperations. Poor news reporting misrepresents both valid and invalid research findings. Somewhere among all the noise is legitimate information on how to eat well. For that reason, I appreciate The top nutrition myths of 2019 from Examine.com. Dig into the article for more information. Know how different meats stack up. My wife and I are especially concerned about greenhouse gas emissions. Our food choices come with come with a greenhouse gas cost. Meat production produces an especially large amount of CO2 and methane. Accordingly, we now limit our meat consumption, especially of beef and lamb which produce the most greenhouse gas. We haven’t gone vegan but we have made the deliberate choice to reduce our animal product consumption. Animal welfare is also a concern of ours. The article also links to the Environmental Working Group (EWG.) EWG provides this guide to animal welfare standards and labeling of meat and dairy products. We haven’t abandoned meat completely, but we don’t want to contribute to the suffering of animals. This guide has helped informed our food shopping. You might find it useful too. Appearances to the mind are of four kinds. Is the wise man’s task. I’m neither a researcher nor a statistician but I respect the need for solid research into health, fitness, nutrition, and the like. I understand that valid research requires a large number of study subjects. The best studies are designed as double-blind placebos. Finally, research results must be replicated several times over in order to be seen as valid and worth taking seriously. Beyond that, I don’t have a good grasp of statistical methods so I can’t always tell if the conclusions drawn from the research are accurate. Thus I’m often confused by what I see and hear around nutrition research. If you consider yourself a well-informed, educated, healthy person who finds yourself confused by conflicting nutritional studies then an article in the New York Times, More Evidence That Nutrition Studies Don’t Add Up, may help you understand your frustration. The story discusses the shoddy research practices of Cornell University researcher Dr. Brian Wansink. “In 2012, Dr. John Ioannidis, the chairman of disease prevention at Stanford, published a study titled “’Is Everything We Eat Associated With Cancer?’” He and a co-author randomly selected 50 recipes from a cookbook and discovered that 80 percent of the ingredients — mushrooms, peppers, olives, lobster, mustard, lemons — had been linked to either an increased or a decreased risk of cancer in numerous studies. In many cases a single ingredient was found to be the subject of questionable cancer claims in more than 10 studies, a vast majority of which “’were based on weak statistical evidence,’” the paper concluded. Nutrition epidemiology is notorious for this. Scientists routinely scour data sets on large populations looking for links between specific foods or diets and health outcomes like chronic disease and life span. These studies can generate important findings and hypotheses. But they also have serious limitations. They cannot prove cause and effect, for example, and collecting dietary data from people is like trying to catch a moving target: Many people cannot recall precisely what they ate last month, last week or even in the past 48 hours. Plenty of other factors that influence health can also blur the impact of diet, such as exercise, socioeconomic status, sleep, genetics and environment. All of this makes the most popular food and health studies problematic and frequently contradictory. In one recent example, an observational study of thousands of people published in The Lancet last year made headlines with its findings that high-carb diets were linked to increased mortality rates and that eating saturated fat and meat was protective. Then in August, a separate team of researchers published an observational study of thousands of people in a related journal, The Lancet Public Health, with contrasting findings: Low-carb diets that were high in meat increased mortality rates. If this topic interests you then you should also read Congratulations. Your Study Went Nowhere, also from the New York Times. Among other things, it discusses an interesting problem with research publication. That is research with positive findings gets published far more than research with negative findings. Publication bias refers to the decision on whether to publish results based on the outcomes found. With the 105 studies on antidepressants, half were considered “positive” by the F.D.A., and half were considered “negative.” Ninety-eight percent of the positive trials were published; only 48 percent of the negative ones were. Outcome reporting bias refers to writing up only the results in a trial that appear positive while failing to report those that appear negative. In 10 of the 25 negative studies, studies that were considered negative by the F.D.A. were reported as positive by the researchers, by switching a secondary outcome with a primary one, and reporting it as if it were the original intent of the researchers, or just by not reporting negative results. We never hear a TV news reporter say, “Nine studies found absolutely no relationship between food X and cancer.” In other words, we only hear the bell that’s rung, not all the other bells that aren’t rung. The obvious problem is that if shoddy research findings are reported (vaccines linked to autism is a prominent example) and we may hear reports from multiple credible sources, then we start to believe false information. There are serious consequences to this problem. Diabetes and obesity-related illnesses are rife in the modern world. What we eat and how much we eat seem to be culprits. Recent research suggests that specifically, too much fructose is a significant problem for the human digestive system. An article from The Economist titled How too much fructose may cause liver damage discusses research in the journal Cell Metabolism. It seems that small amounts of fructose are digested safely. Too much fructose consumption is a problem. If you look around you, you’ll see A LOT of food sweetened with high-fructose corn syrup. Think that might be a problem? Humans haven’t had access to refined sugar until recently in our long history on earth. Fruit is seasonal. It doesn’t sit around for long. In our past, we had to compete with all the other animals in the forest and the jungle to eat the stuff. Either that or it would fall off the tree and rot. Honey, as you know, is guarded by little stinging monsters which makes acquiring that source of sugar a bit costly. The candy business started in the early 20th century. A hundred years may sound like a long time but in terms of evolution and the human digestive system, it’s an incredibly short amount of time. So our digestive system—a system refined over millennia of natural selection—has suddenly been deluged by sugar. We’re unequipped to deal with this recent development, so we see the problems described above. Gluttony Season is Almost Here. What’s Your Plan? Halloween kicks off several months of partying, gobbling, and guzzling. Very soon, swirling all around you there will be a galaxy of the richest and tastiest food and drink. Not only do you have a list of occasions for feasting, but also the days grow cold and dark. That means you’re less likely to be active and more likely to huddle in your warm, cozy home. Is it any surprise that you tend to gain unhealthy weight under these conditions? In all truth, it’s not a done deal that your health and fitness must suffer. You’re a grown-up. You can make good decisions. With some forethought, planning and awareness, you can avoid the slide backwards into feeble flabbiness. Will you eat 1-2 fist-size servings of vegetables at each meal? Will you limit sweets and/or booze to one day a week? Will you talk to a friend or loved one about eating better and exercising together? Will you consider hiring a trainer now instead of in January or February? If it’s important then why wait? There is a lot of important research out there on subjects like exercise physiology and nutrition. I’m not a researcher and I have a difficult time deciphering information that I know is useful to me and my clients. So I appreciate Alex Hutchinson’s Sweat Science blog in Runner’s World. He does a great job of discussing complex research findings in language that I can understand. 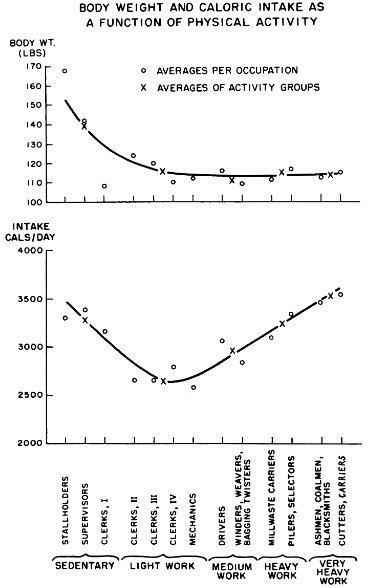 “What you see is that, above a certain level of physical activity, caloric intake increases linearly and weight is stable. For these workers, the body’s “balance” mechanism is functioning, and those who burn more calories also consume proportionately more calories. I’ve never thought about the effect that exercise has on appetite beyond that it probably increases it. That exercise may make appetite more accurate is very interesting to me. I have found that I tend to lose weight when I’m training a lot. When I try and track my calories while training I often find that I go over my suggested caloric intake and I still lose weight. I simply eat the amount that feels right and I’m able to maintain or improve my body composition. It’s much tougher to do though when I’m not training hard. That’s been a curious thing to me. This research seems to speak to my observations. I mentioned in the last post that I was reading and enjoying Matt Fitzgerald’s Diet Cults. Chapter five of his book contains some information that I found very thought provoking. This chapter discusses the process and details of those who’ve successfully maintained weight-loss. The National Weight Control Registry observed several key behaviors in those who lost weight and kept it off. Weighing: If weight-loss is your goal then looking at a scale will tell you if it’s happening. More important than habits is the motivation that underlies these habits. Motivation is different from willpower. Fitzgerald suggests that motivation activates will power, sort of like computer software (motivation) activates the hardware (willpower). 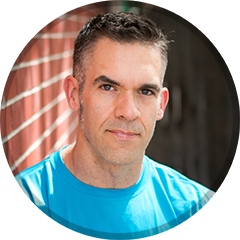 He says that “evidence suggests that most people have all the willpower they need to lose weight and that what separates the successful losers from the failures is motivation. The NWCR study found that 90% of members reported having failed in previous weight loss attempts. In other words, these people failed a lot. It seems the people who succeeded kept on trying due to motivation. This got me thinking about my own views on willpower vs. motivation. It seems that we often talk about willpower as a negative thing. We criticize ourselves because we don’t have enough of it and we wind up eating a bunch of cake. Or else we see overweight people, drug addicts or smokers and we say they don’t have the willpower to lose weight or quit. The word willpower mostly seems to come up when there’s something negative drawing us towards it and we know we’ll succumb to this evil thing, and then we’ll hate ourselves afterward. The practice of willpower seems a cold, Spartan type of undertaking. In contrast, something that motivates us is a positive thing that we want. It’s something that makes us look past the temptations, triggers and roadblocks to our success. We may not be perfect in our eating and exercise habits but the motivating factor makes us keep trying. I think in a lot of cases motivation actually makes us want to undertake the healthy behaviors that lead us to our goals. As noted in Diet Cults, it’s motivation that makes for successful willpower. Not that everything about our motivation is positive. Fear may be a great motivator. For instance, a doctor says, “If you don’t lose weight you’ll have a heart attack in five years.” For a lot of people, that may be the type of revelation that motivates them to lose weight. A similar scenario may play out if we lose a loved one to a preventable illness like diabetes. Maybe shame motivates us. I recall a client who stepped on a scale, saw the numbers and said, “That’s it! I can’t do this anymore. I HAVE GOT TO LOSE WEIGHT.” And he did. I was speaking to a very wise friend about all of this and he said that inherent in this motivation to change is a genuine belief that a change for the better is possible. Beyond the fear mentioned above, we must see and believe in a better life for ourselves. A living belief in a better future sustains motivation. Without this belief motivation withers and dies. From what I know, motivation must come from within. I’m not sure how to impose motivation on someone. I think perhaps I can draw motivation out of a client by asking the right questions. This is a challenging prospect! This involves a developing a fairly intimate relationship with a client and asking some nuanced, sensitive questions. This has given me a lot to think about. What motivates you in your fitness endeavors? Surely something must motivate you to wake up early or carve out time in your busy day to grunt, groan, sweat and lift heavy objects. Most of you aren’t pro athletes or models. So why do you do it? I’d like to know. What makes you keep on keeping on?